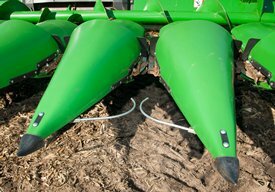 The intermeshing knife stalk rolls are the best equipment when the typical harvesting condition is wet corn and using the StalkMaster™ stalk chopping option. Majority of stalk material will be sized at 15.2 cm (6 in.) or longer to provide soil protection from wind and water. Designed to harvest with low power consumption for high performance and low fuel consumption. Manufactured of highly durable material for longer wear life. 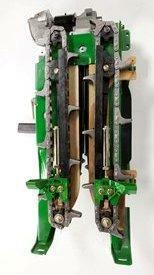 Intermeshing knife stalk rolls consist of six full-length blades that contact the crop. The blades cut, crimp, and break the stalks as they are pulled down through the rolls. 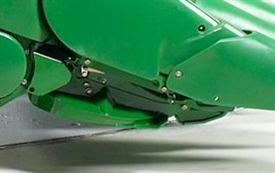 The full-length blades provide total crop contact for maximum chopping and cutting action from the front to back. Intermeshing knife stalk rolls are also available on StalkMaster™ corn heads. Rolls are constructed of austempered ductile iron material with a dual coating in the front 7.6 cm (3 in.) of high-wear zone for longer life. The stalk rolls turn at 735 rpm when back shaft speed is at 490 rpm. The tip speed compared to the gathering chain speed is optimized to reduce MOG intake and increase overall capacity while minimizing losses. The single-piece cast-knife roll design provides excellent serviceability when replacement is required. 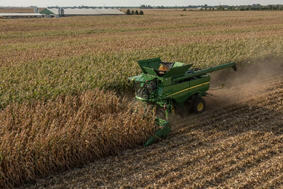 AutoTrac RowSense is a solution for corn growers that increases machine efficiency and reduces operator fatigue. AutoTrac RowSense offers operators the same high levels of convenience and productivity experienced in other crops or with AutoTrac-equipped tractors and self-propelled sprayers. Maintains harvesting efficiency in down crop and low-visibility (dusty) conditions. Increases the acre-per-hour performance potential and reduces grain loss. Enhances operator comfort and reduces operator stress. 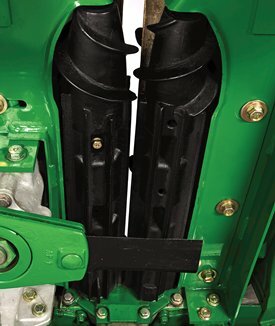 Hydraulically adjustable deck plates allow the operator to adjust the deck plate opening on the go in order to match changes in stalk or cob size and crop conditions. Minimize material-other-than-grain (MOG) intake providing improved separator performance. Reduce ear loss to maximize potential yield. Minimize premature shelling and kennel damage proving sample quality. Hydraulic deck plate feature is controlled by the operator with the multifunction control handle on the go from the cab. The deck plate spacing indicator is displayed on the corner post display and on the CammandTouch™ display unit on the armrest. Deck plate resume is also featured with hydraulically adjustable deck plates. 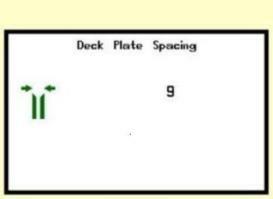 Three deck plate positions can be programmed for varying crop conditions using the resume feature. The StalkMaster Corn Head chopping system allows operator size and chop corn stalks while harvesting, eliminating second-pass operations and saving time. StalkMaster is available on 606C, 608C, 612C, 612FC, 616C, and the 618C Corn Heads. Uniform sizing of corn stalks to speed decomposition and also providing for soil protection from wind and water. 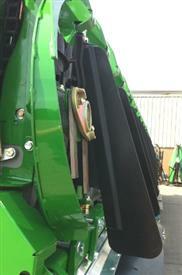 Eliminates the need for the second-pass operation to size stalk residue, saving time and expense. Can be equipped with either intermeshing or apposed knife stalk rolls to match the agronomic needs of individual growers. Features a quick, no tools, disconnect feature that provides producers the flexibility to chop, or not, when desired. 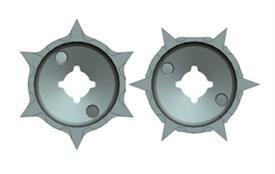 Each of the StalkMaster row-unit gearcase is equipped with two heat-treated and wear-coated rotating blades positioned below the stalk rolls. As stalks are pulled through the rolls stalks are cut to size and distributed evenly throughout the row. If the blades encounter an obstruction they will swing backward avoiding damage and interruption to harvest. Blades can be reversed to extend their useable wear life. The gearcase on the StalkMaster row-units feature a no tools needed disconnect. Each row has a convenient shifting lever on the right side of the gearcase to turn the function on or off in a matter of minutes. A heavy-duty slip-clutch design protects both the row-unit gearcase and the StalkMaster lower chopping unit gearcase. If the clutch slips, the operator will know immediately. 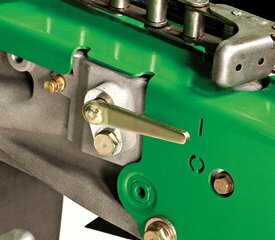 StalkMaster chopping heads feature side- and rear-mounted rubberized curtains to optimize chopped crop residue distribution. Also, the right-hand side of the head has an additional shield for protection from protruding blades. 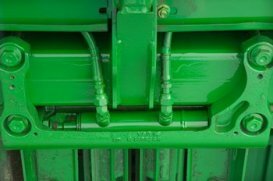 Enclosed chain cases drive the gathering chains and stalk rolls for each row to provide robust durability and uninterrupted harvesting. Heavy-duty bearings mounted in machined castings along with O-ring seals increase life and improve serviceability. Continuous-loop American National Standards Institute (ANSI) #100 chain allows for higher loads and longer life by eliminating all connector links and half links. 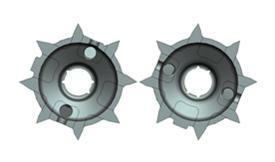 The large-diameter sprockets along with large 38-mm (1.50-in.) transverse hex back shaft and row-unit shafts provide for improved sprocket and chain life. 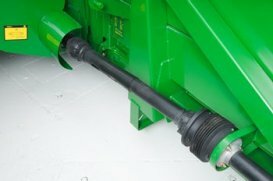 Telescoping drive shafts mount to the splined feederhouse back shafts on all 50, 60, 70, W-, T-, C-, and S-Series Combines. 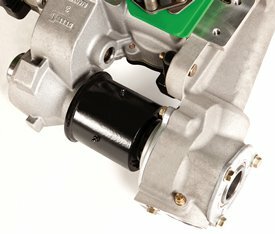 The coupler features an 8-degree index, allowing the operator to match the drive shaft splines without rotating the platform feederhouse. 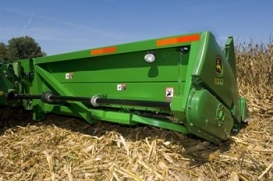 The opposed knife stalk rolls are the best equipment when the typical harvesting condition is dry corn and using the StalkMaster™ stalk chopping option. Majority of stalk material will be sized at 12 inches or longer to provide soil protection from wind and water. Rolls are designed with eight opposed, full-length blades that result in better stalk control, improved stalk processing, and reduced material-other-than-grain (MOG) intake. 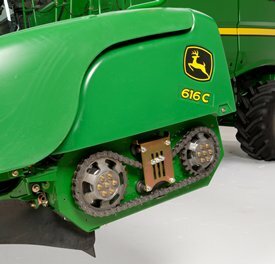 This eight-blade design improves function and reduces localized blade wear in the front of the rolls. Rolls are constructed of austempered ductile iron material with a dual coating in the front 7.6 cm (3 in.) of high-wear zone for longer life. The stalk rolls turn at 1050 rpm when back shaft speed is at 700 rpm. The tip speed compared to the gathering chain speed is optimized to reduce MOG intake and increase overall capacity while minimizing losses. The single-piece cast knife roll design provides excellent serviceability when replacement is required. Product modules and features has been compiled for worldwide circulation with general information, pictures, and descriptions of features not available in all countries. In some countries, products and accessories may require modifications or additions to ensure compliance with local regulations. Contact your local John Deere dealer for details.